Are your processes fair enough? Let me play a little game with you, just to introduce the subject of this post. I am a project manager and you are a member of the project team. I have put in place all sorts of management processes and I have bound team members bonuses and prizes to the outcomes of these processes. This is one process that I put in place and that now you will have to apply. Your quarterly bonus depends on the fact that I will consider reasonable and satisfying the outcome of the process. Follow this process. You can use a piece of paper and a pen. Choose a number between 1 and 9. write it on the piece of paper. Add 8 to the result obtained in point 2. Divide by 2 the result obtained in point 3. Subtract your original number from the result obtained in point 4 and write the result on the piece of paper. Choose a U.S.A. state whose name begin with the letter you have found. Add 1 to the result obtained in point 5 and write the result on the piece of paper. Convert the result in point 7 to a letter with the same method you have used in point 6. Choose the biggest animal you can think about whose name start with the letter you have found. Now...well...I am very very very disappointed from your performance. there are no elephants in Delaware...very unsatisfying... you can kiss goodbye your quarterly bonus. Are you disappointed? I think you are. You have plenty of reason to be disappointed. Many mistakes have been made in implementing this process, but we will focus on what I judge to be the worst four. At the beginning of the post I wrote that I would have granted you a bonus if, and only if, I would had found “reasonable and satisfying the outcome of the process”. So? What is this supposed to mean? Nothing. If you put in place a project management process and you bind your team members bonuses and prizes to the outcome, be sure to give measurable objectives. Otherwise every denied bonus will be seen as an arbitrary punishment and every granted bonus as an unjustified gift. Each case you will be experimenting a sudden collapse of trust among your team members. You had no control on the output of the process that I put in place and that I forced you to follow. Every input you would have given would have led you to the same result. So what is the point in binding your bonuses on that? Again, as in the previous point, every denied bonus will be seen as an arbitrary punishment and every granted bonus as an unjustified gift. You will be experimenting a steady collapse of trust in the team and you will grow harsh criticism about every step the management will take. Discontent will spread. Chose a number between 1 and 9. write it on the piece of paper. Let’s say the number you chose is X and the result you obtained is Y. Double it. Ok, now you have Y=2X. Add 8 to the result obtained in point 2. Here we obtain Y=2X+8. Divide by 2 the result obtained in point 3. Now Y=(2x+8)/2=X+4. Subtract your original number from the result obtained in point 4 and write the result on the piece of paper. Y=X+4-X=4. Convert the result from point 5 into a letter in the English alphabet (es A=1, B=2, C=3,...). The letter you got was D.
Choose a U.S.A. state whose name begin with the letter you have found. There is only 1 U.S.A. state whose name starts with D. Delaware. Add 1 to the result obtained in point 5 and write the result on the piece of paper. The number you got was 5. Convert the result from point 7 to a letter with the same method you have used in point 6. The letter you got was E.
Choose the biggest animal you can think about whose name start with the letter you have found. Elephant is a good choice. If you put in place a project management process and you bind your team members bonuses and prizes to the outcome, be sure that your process is flawless. Your team members will not follow your process, because they want achieve their bonuses and prizes and because your process outcomes go to detriment of the project. Your team members will follow your process and contextually will experience a lot of frustration. You are sure to have an high degree of disengagement...and probably a lot of elephants in Delaware. Either cases lead to the same result. The project will rapidly go out of control and disappointment will spread among all of your stakeholders. Make another little experiment. Buy a cookies box and tomorrow morning, as soon as you enter the office, gather three of your collegues and offer them some cookies. You will offer four cookies to two of them and you will say to the third one that he/she can take just one cookie. Chances are that the third collegue will ask you why he/she can get just one cookie. There is no point in asking, since cookies are yours and you do not owe nothing to your collegues. You can share your cookies if you want to and decide freely how many cookies offer to whoever you want but still, the third collegue will ask you about it, maybe laughing, but he/she will ask. Maybe even the other two collegues will enquiry you about your behavior. And you know why? Beacuse deep inside they feel that your process is unfair. Even if they have been prized in this occasion, they know that they cannot trust your process. They know that they cannot trust you. My point is to always check that your processes are fair. People can stand almost every situation and deprivation, but just if they feel that the processes are fair. Solve this very easy riddle. I am a very big mammal. I have a grey thick skin. You can find me in Africa but I have cousins in Asia. I have been (and I am still) hunted by humans because of something that grows near my mouth. Did you expect to meet this other African friend? Well...you are not totally wrong...or more precisely...you are right...too. From the data at your disposal both the answers were right. Both these animals are big herbivorous mammals with a grey thick skin. Both of them are present in Asia and have been hunted almost to extinction because of something that grows on their muzzle...and yes...nose and mouth are quite near. The fact is that you have been provided with true but incomplete data and your brain automatically tried to fill the gaps in the best way it could. It tried to interpolate data where informations were lacking. This capability is something wonderful and amazing at the same time. Your brain, starting from some provided data and past stored knowledge, suggests you answers when you have to take decisions. This same capability is what comes at your help when you have to make an educated guess about some event in the future. I value this as one of the most important characteristics of human beings. Please, do not have fear, in this specific case is not your brain that have deceived you...but the other way round...you probably have not provided him with enough time to give a well crafted answer to the riddle I proposed you. Probably if you had waited a little, if you had just taken your time before trying to give the answer it would have come to your mind that the riddle would have been satisfied by at least two answers. The problem was that everything seemed so perfect, the data seemed so accurate, so precise that you jumped directly to your conclusion. This happens in day to day life and in project management too, whenever we have to deal with data and/or assumptions to take decisions. Sometimes we trust too much the data we have been provided with or the assumptions we have accepted as true, especially when data seem so well crafted and our first answers seem to fit so magically...in this cases sometime we are driven to rush headlong to conclusions. 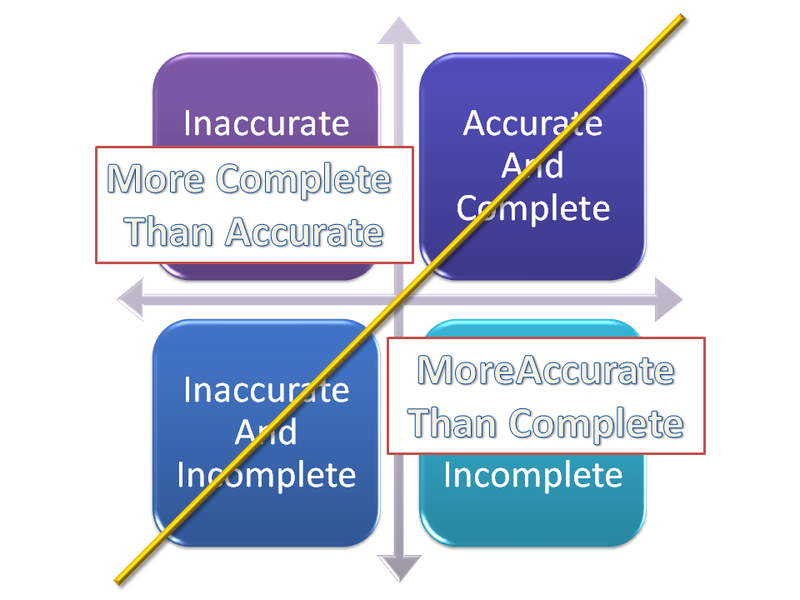 In Figure1 we can see a pictographic representation of a two dimensional data space, where data and assumptions are placed using their degree of completeness and reliability. Above the yellow line we have data and assumptions more reliable than complete. This is the same situation we have faced with the riddle. Below the yellow line we can find data and assumptions more complete than reliable. In the first situation efforts have to be made to collect more data and to refrain from giving the answer too quickly. Take your time. If it is too good to be true...probably it is not true. So try to collect fresh informations and evaluate alternatives to your decision. In the second one efforts have to be made to verify and validate data and assumptions, discarding corrupted ones. The problem is...how do we know that our data are not reliable or our assumptions are fault? Well...the only answer I can offer is to never get tired to analyze, check, question and validate. Always perform data and assumptions sanity checks, base your analysis on literature, consult with the team, consult with the stakeholders, consult with other project managers and with your project management office... Check lessons learned related to other similar projects if you can access them. Maintain these behaviors for all the project life. Never get tired to evaluate alternatives and to question and check your data and/or assumptions...or you run the risk to mistake an elephant with a rhino...or even worse...an assumption with a million dollars gamble.